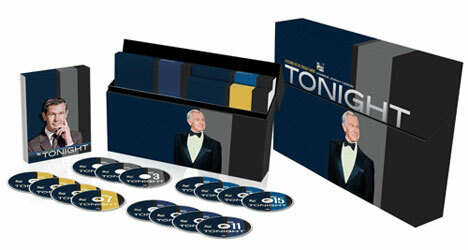 TV on DVD: "Tonight: 4 Decades of 'The Tonight Show Starring Johnny Carson'"
What made Johnny Carson the late-night king? Scott Malchus takes a look in his review of a new box of Tonight Show episodes. Johnny Carson was the king of late night for a reason. He could handle any situation put in front of him with ease and he never lost his cool. When a joke, a sketch or a guest were about to go bust, all Carson had to do was make a deadpan glance at the camera, roll his eyes, or deliver a perfectly time comeback to create a classic comic moment. Together with his trusty sideman, Ed McMahon, and bandleaders Skitch Henderson (up until 1966) and Doc Severinsen, Carson ruled the after hours because he was always in control. Before the airwaves became crowded with late night yap fests, there was only one destination if stars wanted to plug their projects or simply sit down and have a good time for an hour. That place was the couch next to Carson’s desk. This beautifully packaged box set contains 15 discs of complete episodes (not highlights) covering Carson’s four decades as Tonight Show host. It offers just a taste of the wit and genius that Carson possessed. Starting with his wily days as a young gun in the 60’s, transitioning to the 70’s, when he became the consummate talk show host, sliding into the 80’s when he hit his peak, and wrapping it up in the early 90’s, just before he decided it was time to retire, the 30 hours on these DVD’s offer a chunk of television history. Anyone who enjoys Dave, Jimmy, Conan, Craig, the other Jimmy, Leno, and maybe Lopez, should watch this collection to understand what all of those hosts are trying to achieve each night. They’re all successful in their own way, but none of them have the same stature as Carson. 4 Decades of The Tonight Show has enough variety to appease everyone. There are episodes featuring stand up performances by famous comedians in the years when they were just starting out. Famous names like Woody Allen, The Muppets, Albert Brooks and David Brenner show up in the 60’s and early 70’s. In the mid to late 70’s there are appearances by Chevy Chase, Richard Pryor, Steve Martin, Jay Leno and Garry Shandling. The 80’s bring us Robin Williams at the height of his insanity, Jerry Seinfeld and Bill Maher. As the show winds down, there are appearances by David Letterman, Eddie Murphy and Ellen DeGeneres. Carson helped break many of these artists and seeing them appear here is enlightening. In addition to the spotlight on stand up comedy, Carson’s Tonight Show was a place where celebrities could stop by to hang out and laugh. Some of Carson’s greatest guests are also a part of this box set, including Don Rickles, who is funny no matter what era he’s in, Bill Cosby, Billy Crystal, Frank Sinatra Sid Caesar and Milton Berle. One of the most interesting guests is a 1988 appearance by a young Bill Clinton, in which he appears just after the Democratic National Convention and Carson ribs the politician for giving an extraordinarily long speech. As a drummer who grew up to stories of the legendary Buddy Rich, my favorite episode features the world famous drummer as her performs with the fabled Tonight Show band. With the camera up close as he commands the drum kit, it was a marvel to watch. Then, he joined Johnny at the couch for a conversation, something the new crop of late night artists rarely do with musicians (usually the band closes the show and that’s the end). The wealth of entertainment on these 15 discs is too much to be summed up in one review. I’ll wrap this up by saying that the real attraction of these DVD’s is Carson, not the zany characters or fantastic musicians. Always one step ahead of is guests, ready to pounce on a comedic opportunity, Carson was on top of his game up until his final years. Even then, when his shtick was getting a little tired, Johnny was sharp enough to realize that it was time for him to step aside for the next generation of talk show hosts. That generation, and the one that has followed, are still trying to live up to the standard that Carson set. I question if they ever will. This collection can be purchased through Amazon or the Johnny Carson website.